CustomTowels.com - 30x60 Terry Beach Towels Cotton Velour Tie Dye, 11.5 lbs per dz. 30x60 Terry Beach Towels Cotton Velour Tie Dye, 11.5 lbs per dz. 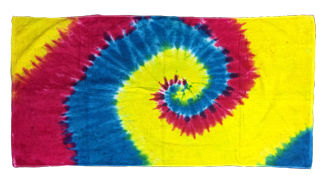 30x60 Tie Dye Beach Towels.11.5 lbs per dz. Limited Supply available. Pack 24 pcs per case. Min order is one case of 12 towels. SPECIAL DISCOUNT 34x70 Terry Cotton Beach Towels by Royal Comfort. 19.0 Lbs/ Dz, 100 % Ring Spun cotton. 30x62 Terry Beach Towels Cotton Velour Cabana Stripe 11 lbs per doz, 100% Cotton. 32x64 Terry Cotton Beach Towels by Royal Comfort. 15.0 Lbs/ Dz, 100% Ring Spun cotton.